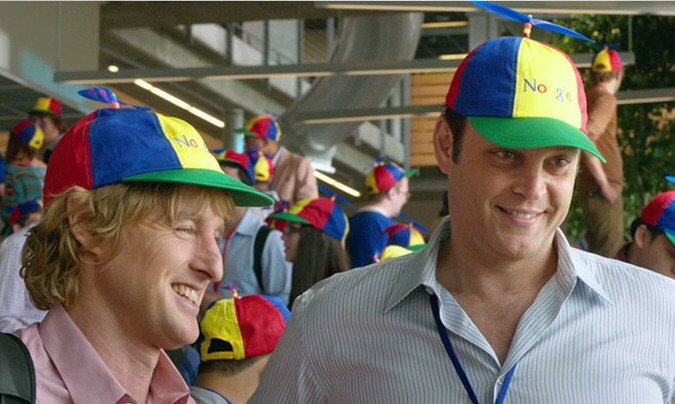 Wilson and Vaughn in "The Internship"
The 'Wedding Crashers' co-stars have reunited for the comedy – which sees them play interns at Google – eight years after their previous success and they were thrilled to have their young kids visit them at work. Speaking about his two-year-old son Ford, with ex-girlfriend Jade Duell, Owen said: "In 'Wedding Crashers' we didn't have little kids visiting the set. It wouldn't have been appropriate maybe for little kids, but I think on 'The Internship' it was nice. It was nice to have my son visit - and Vince's family." Meanwhile, Vince- who welcomed daughter Locklyn with realtor Kyla Weber in December 2010 –added: "My daughter came to set. That was awesome. I don't know if she'll remember it. She's so young! But it always makes it fun for me." The duo also jumped at the chance to work together again. Vince, 43, said: "It's always fun to work with Owen because I'm such a fan of his,” while Owen, 44, added: "I couldn't believe it had been so long since 'Wedding Crashers'. There had been some ideas floating around, and when Vince had this idea for us to be interns at Google, it just seemed like a funny opportunity for us to make a movie."